Facebook is the largest social media platform in the world. As a website owner, you may already be engaging with your audiences on Facebook through your Facebook page or by creating a Facebook group. However, all the posts you make on Facebook are not visible to the people visiting your website. By adding a custom Facebook feed you can show what’s happening on your Facebook page or group to your site visitors. This will allow more of your users to see your posts and will help you get more Facebook likes. If you are using Facebook remarketing/retargeting pixel on your website, then you can show your ads to those users on Facebook as well. 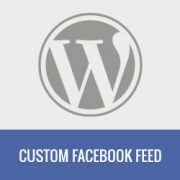 Having said that, let’s see how to add a custom Facebook feed to your WordPress site. First thing you need to do is install and acivate the Custom Facebook Feed plugin. For more details, see our step by step guide on how to install a WordPress plugin. Note: This free version of the plugin does not display images in shared links or status updates. For that you will need plugin’s PRO version. Upon activation, you need to visit Facebook Feed » Settings page to configure the plugin settings. If you want to add a group, then you will need to enter your group ID. Simply visit Find My Facebook ID website, and enter the URL of your group in the search box. The website will reveal your Facebook group’s numeric ID. The next thing you need to enter is an access token. The plugin will work even if you don’t add your own access token, however it is recommended to generate it and add it here. 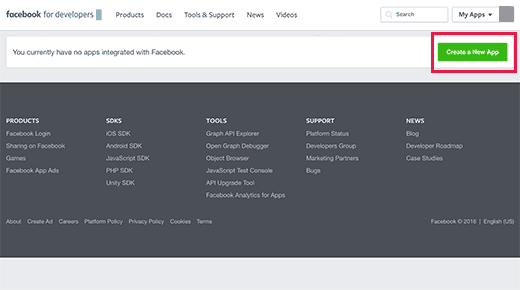 Simply visit Facebook developers website and click on the create new app button. This will bring up a popup where you need to enter a name for your app. Provide an email address and then select a category for your app. Click on the ‘Create App ID’ button to continue. 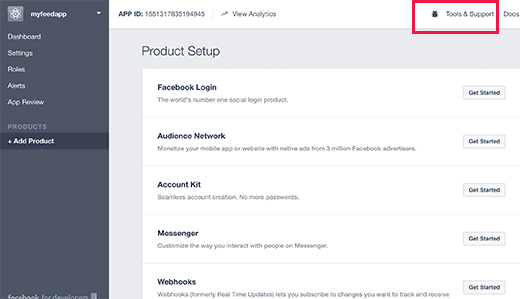 Facebook will create an app for you and will redirect you to the app’s dashboard. You need to click on Tools & Support link at the top. This will bring you to a page with lots of resources on how to use Facebook apps. You just need to click on ‘Access token tool’. 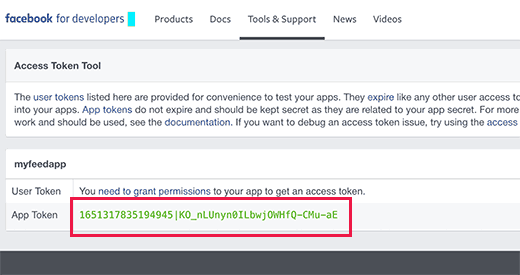 Clicking on the link will take you to a page where you will be able to see your app’s access token or app token. 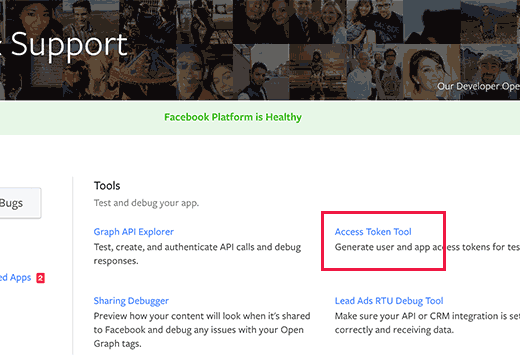 You can now copy and paste this access token to the custom Facebook feed plugin’s settings page. Under the settings section on the page, you need to select whether you are showing a group or a page. You can also choose the number of posts to display, timezone, and language settings. You can now save your page or post and preview it. It will fetch and display latest posts from your Facebook page or group in your WordPress page. 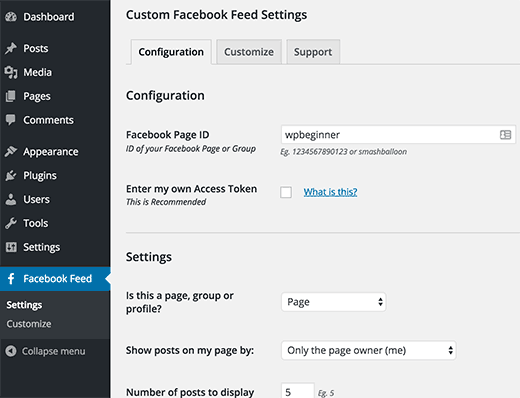 Let’s suppose you want to display more than one custom Facebook feed on your WordPress site. The plugin’s settings only allow you to add one page or group ID. However, you can easily use the shortcode to display any other custom Facebook feed you want. The plugin’s shortcode comes with a whole range of parameters. 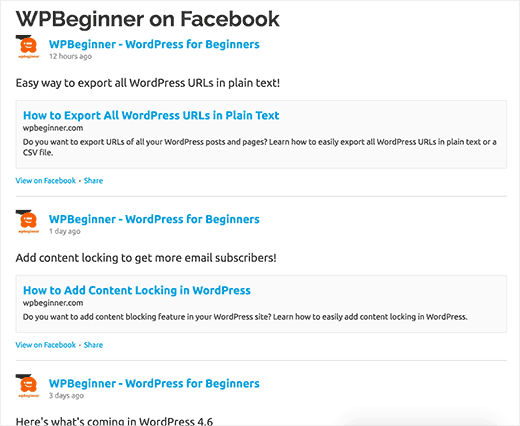 You can visit the plugin’s website to see the complete list of parameters that you can use. 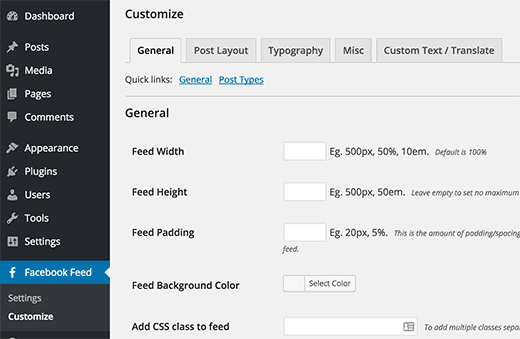 The plugin allows you customize the appearance of the custom Facebook feed on your website. Visit Facebook Feed » Customize page to edit the customization settings. The customize section is divided into different tabs. Each tab has its own options, you may want to review them to customize the appearance of your custom Facebook feed. 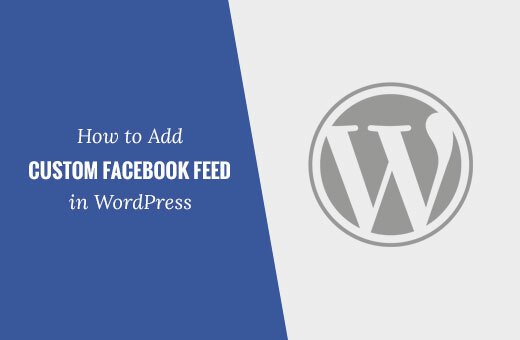 We hope this article helped you add custom Facebook feed in WordPress. You may also want to see our list of 21 best social media monitoring tools for WordPress users. Can you cover how to automatically copy posts to 2 FB pages? You absolutely have to create a Facebook apps, the only good method! Any plugin that will grab a FB ‘status’ from a personal (publicly visible) FB account into a separate post? So that each new status will create a new post? Thanks for sharing this post. Please let me know if free plugin are available for creating custom facebook feed. Great sharing. I am new in WordPress. I don’t know everything about WordPress. Your article will help to create custom facebook feed in my WordPress site. Thank you for sharing such an informative article. Do you recognize the feed on the homepage of I like the fact that it includes thumbnail pictures from each post. I find that more visually interesting than showing my logo over and over in the feed. I don’t control that area of the website (although I do know that it is WP) and the host has no interest in sharing which plugin is used.